There was actually a Judge called “Learned Hand”? This is more perfect than anything Mel Brooks could conceive. However, I believe you have missed an essential point in the debate over tax avoidance/minimization, and that is that the wealthy have much better access to these services than the working classes, and hence the ability to minimize taxes is not equal and only those who can afford it can benefit from it. When that situation applies to other facets of society, such as access to health care, education, and employment, the Government is obliged to step in and assist with providing a level of universal access, often done via State funded health services, student loans & grants, and subsidized apprenticeships. Will the Government be stepping in and providing subsidized Tax advisory/minimization services for the working classes? Imagine that, a working class person walking into a Government run agency whereby the agency would complete the necessary paperwork required in order for this bicycle courier to register herself as an offshore company which contracts out the ‘delivery’ part of the business to it’s sole employee who is taxed only on the portion of income attributable to the delivery, for example, 1/3 of the £6 an hour that ‘off-shore company’ receives for its services, and the remaining £4 per hour revenue is taxed in the offshore location at 0%. The ‘off-shore company’ then sends the £4 per hour back to the Director of the company (who is also the sole employee) as a dividend payment, which under the applicable tax treaty between the offshore location and the UK, is exempt from tax. The bicycle courier then declares that £4 on her tax return not as income (taxable at the top rate), but as ‘Director’s fees taxed at source’, and is only required to pay 3% tax on that. At the same time, the bicycle courier is able to write off £1 of her £2 income as ‘bike maintenance’, and thereby qualifies for the lowest rate of tax due to her income being in the lowest tax bracket. Absolutely no problem with the above system as long as everyone is able to participate in it. However we no that is not the case, and hence complaints, which you and Judge Learned Hand claim are morality based. I claim they are equality based. Second point, this ‘scandal’ has disappeared very quickly, and excepting the Icelandic PM (who resigned more because of the conflicts of interest that were discovered from the leak, rather than the fact he was minimizing his taxes), no repercussions have been meted out. It has merely, as you say, ‘tarnished’ some reputations. Wet bus tickets. For readers, I acknowledge Roberts’ FATCA and CRS expertise, as I work in the same department of the same bank as him. 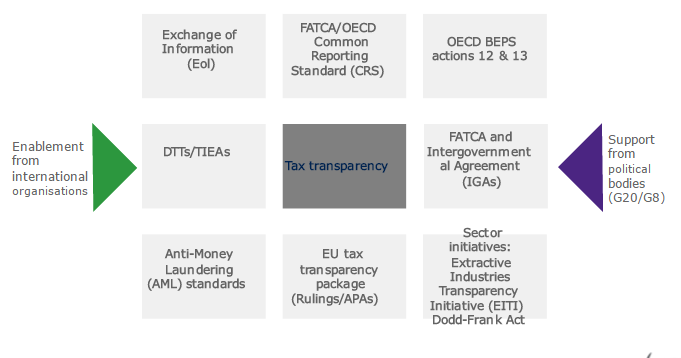 I also agree that it is a systemic issue, and that global co-ordination of policies implementing laws and information sharing to combat tax avoidance is progressing quickly. However I disagree that an oversight organisation monitoring/investigating tax avoidance would have much impact, as the ocean is simply too large to be monitored by ’employees’. Instead I think that it will only be with the help of big data and technology that nations will be able to identify a majority of tax dodgers and ask them to qualify their income via a tax audit. In the meantime, the system of ‘checks & balances’ is dependent upon vigilante journalists who need to break the law of sovereign nations by committing acts of theft just to bring specific facts to light, which then pass quickly into yesterdays’ news. In addition to vigilante justice, I would like to see the Government come to the party and bring some strong scrutiny to a few of the large companies with multi-national corporate structures in order to keep them honest?